At 9 we are already at the open market ,stalls of dresses, kitchenware, shoes, cloth, materials, ribbons and buttons, plants and flowers. And also we can buy fresh organic vegetables , fruits, cheeses, parmigiano or salami. A lot of locals there to buy or just to meet each other. Let’s immerse ourselves in the market, and then find the straw shop: straw basket and kitchen utensils in olive tree wood. So cute, we buy the tool to make gnocchi but also that gorgeous looking board ,may be not, too heavy, probably just fork and spoon for a salad. A visit to the well known butcher with the fake boar in front, plenty of ham hanging from the ceiling, pecorini cheeses .Then to the baker, just the smell coming out of the door is fantastic. We buy some fruit and then go wine tasting. It’s possible to taste various wines mostly from Tuscany, of course and the system of is really interesting …. in a place where local traditions and modern technologies realize a successful unionwith the automatic tasting isles. The card can be purchased inside the store and has to be inserted in the appliance. By pushing the dispenser button, a quantity of the chosen wine, is automatically supplied and we can easily taste. We, not the driver, of course. Now back home to Podere Le Rose for a nice light lunch, a little relaxing walk to take some pictures and then preparing for the afternoon cooking class. 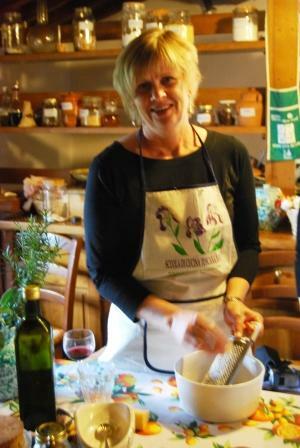 We wear our apron, recipes in hand and then….chopping spinach, mix the other ingredients. Prepare filling for ravioli, taste OK. Mix flour and eggs, prepare ravioli :mix by hand, knead, use rolling pin, use machine, prepare the ravioli shape. Our turkey is cooking in milk . Let’s chop tarragon, mint and other herbs with the mezzaluna. Crostini sauce is ready. Melted butter and sage for ravioli. Simple dessert :gelato stracciatella taste: the machine mix the gelato e we prepare the chocolate…. Now everything is ready…….girls set the table excited to have ravioli :they definitely look attractive. This has been a great day…now to bed…for sure we’ll sleep well….Buona notte!! !